This label is 1.5" in Diameter, 24 per sheet. Neon Fluorescent High Visibility Laser Printers ONLY Permanent Adhesive Label Stock. A "word" about MS/Word Templates. On labels this small, Word templates, combined with Laser and Inkjet Printers can NOT produce precise results. Only with more sophisticated software are results near perfect. 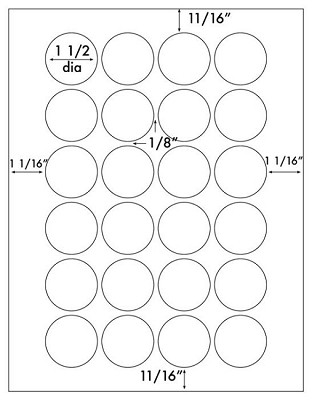 Download the template, and experiment on paper if you are unsure. 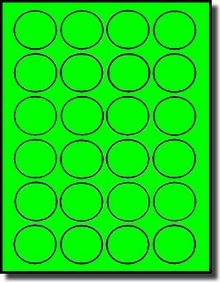 The template only provides the spacing for the square which contains the circle--it does not provide for circular printing. Great for Putting Dates, Numbers or other small amounts of data. A common use is to use date and color to marketing Counted Inventory. Avery® does not currently offer 1.5" Printable Sheet Round Labels. Package of 20 sheets (480 labels) circular NEON GREEN labels, 1.5" diameter, with 4 labels across, and 6 labels vertically. Click the Dimensional Drawing Above to Enlarge.